"What good is sitting alone in your room? Come hear the music play." Like any good musical-loving guy, I have already seen Bob Fosse's Cabaret, the 1972 film adaptation of the beloved 1966 Kander-and-Ebb musical, but I didn't remember loving it that first time. I've seen it staged only one, a brillion years ago, but my roommate (who played Sally Bowles not too long ago) said that any stage version I see will be wildly different from the film. Fosse and the screenwriter Jay Allen took liberties here and there, and consulted the original Charles Isherwood stories upon which the musical is based, as material to expound upon while working on the film, which ended up with eight Oscars (historically, not for Picture, but Director, Actress and Supporting Actor, among others). 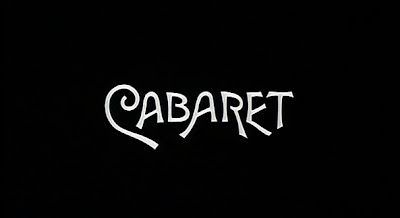 In 2002, Chicago was compared quite a bit to Cabaret, not just for the similar style of song and dance, but also for the way it presented musical numbers in a cinematic setting. What Fosse (wisely) does here is eliminate any song not sung in the cabaret (besides the nationalistic anthem "Tomorrow Belongs to Me," which works on its own terms) in order to keep all the production numbers in front of an audience instead of a camera. There's something tricky about setting up the fourth wall on screen, but most of the songs in the show (and the only ones left here) are direct-address anyway. Not to worry: the Master of Ceremonies (Oscar winner Joel Grey) will walk you through it. It's not too long before we're introduced to the Kit Kat Club's headliner, one Miss Sally Bowles (Oscar winner Liza Minnelli in a star-making performance), a supremely talented singer/dancer whose lack of interest in her own talent is starkly contrasted with her immobility. 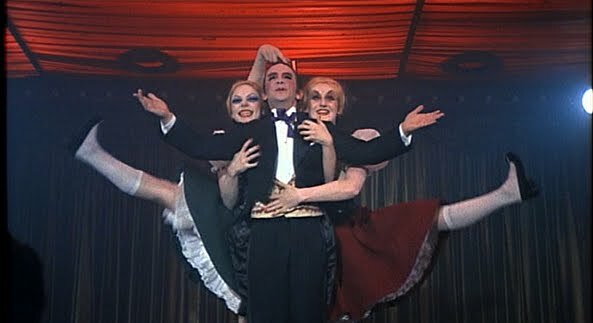 I thought "Mein Herr" was a choreographic highlight (it's a shame I can't embed this one) -- Fosse apparently hated his hands and his premature baldness, explaining why many of his dancers are in hats and gloves (tidbits!) -- perhaps because it's the one that is the most identifiable with Fosse's bent-knee flexed-foot jazz style. What that man did for modern dance ... ugh. Wow. And perhaps the only other character who has considerable weight in this story: Brian Roberts (Michael York), an Englishman studying in Germany with whom Sally becomes quickly enamored due to his pretty pretty face parts. At first, and maybe on the outside, Brian seems conservative, but he takes to Sally as well. SALLY: Do I shock you, darling? If she only knew. He spurns her initial advances on the basis of his homosexuality (later discovered to be bisexuality, more accurately) but a couple of scenes later and after a beautifully rendered monologue in which Sally, with those eyes that seem to reflect the entire world, fears she's discovered the worst ("maybe he's right, maybe I'm not worth caring about, maybe I'm nothing..."), they go ahead and consummate the thing. Ain't that the way? Triumph! As a result, she sings "Maybe This Time," which was not a part of the original stage production but was actually recycled from a previous, abandoned Kander-Ebb effort called Golden Girl at Minnelli's insistence. And to good effect. "Maybe this time I'll win." 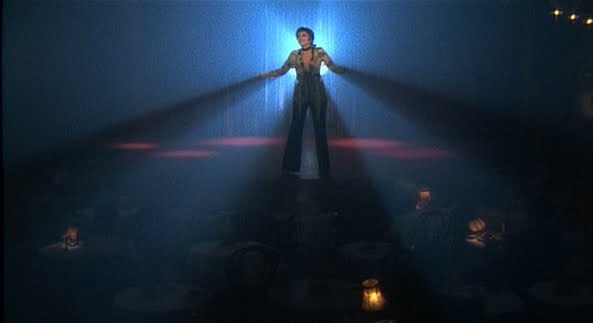 "Maybe This Time" became one of Minnelli's signature torch songs but serves the film as a turning point for Sally's self-esteem. For me, this is somewhat of a problem: girl doesn't need a self-esteem boost, does she? She's just unhappy for some reason or another, regardless of her obvious talent (yes yes, talent alone won't make you happy, but...), but this man in her life means "it's gonna happen / happen sometime." 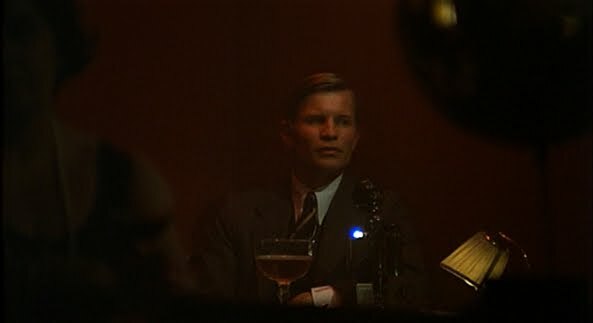 We see outside the world of the cabaret that Nazis are gaining power and beginning to invade this safe world. 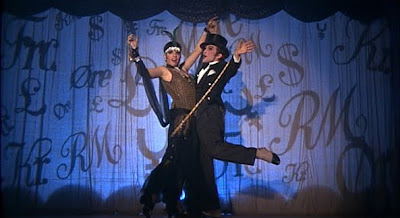 The songs in the cabaret grow more and more political after the first commentary, the delightful duet "Money," in which we are told that "money makes the world go round." I especially love the jab "if you happen to be rich," as if wealth just happens upon a person. "Two Ladies" (deedle-deet dee-dee!) is even more biting than "Money," symbolizing the insatiable greed for carnal pleasure, specifically with two blond Aryan hussies. 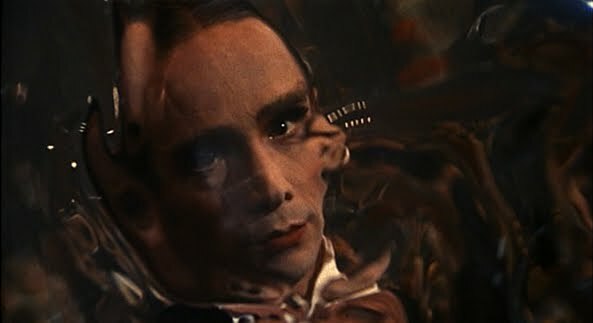 Fosse was such a master at finding the beautiful in the strange, the ugly and even the grotesque. By the time we get to "If You Could See Her Through My Eyes" (the Emcee's dance duo with a lady gorilla), the message is so tongue-in-cheek that it actually ends with a clear anti-Semitic joke. Are the performers working their own message into their show, or are they pandering to the populist message of the day by force? I love not knowing the answer. Meanwhile, the non-musical part of this movie is still happening. The ebb and flow of the Brian/Sally relationship is interrupted by a third party that complicates everything. Am I that invested, involved or interested? Not really, but that doesn't mean I don't want an ending out of all of it. I'm just a little more interested in what the musical numbers have to say cinematically, since I see that going on so much less in the movies. An upside-down love affair. Spidey and Mary Jane? Surprise pregnancy? Tough decisions? Loneliness and rejection? These plot points in a love story seem a dime a dozen, and luckily for the film, the talented performers inject purpose and chemistry of the otherwise flimsy story line. At the end, is anyone happy? We know that the Nazis have yet to do their worst, and the haunting final sequence features the Emcee ducking for cover and a silent pan of the audience, now nearly all in khaki, red and swastikas. There's not even cheery music over the credits. It's spooky. Let's leave the cabaret, shall we, and move a couple years into the future to see George Lucas' last effort before Star Wars made his name forever synonymous with science fiction and fantasy: 1973's American Graffiti.